This week Klaas, one of the researchers at Last.fm released to the Last.fm playground the ability to plot data from your personal listening history. (read about it here: Now in the Playground: Scrobbling Timelines). You can look at when you started to listen to particular bands, or even compare your listening to one of your Last.fm friends (here you can see my cumulative listening as compared to my good Last.fm friend Neil Gaiman. It’s a really neat app that highlights the awesome listening data that Last.fm has been collecting for the last 6 or so years. The integration with your iPhoto library is genius. While you listen to the music that you played in the car on that road trip to Tennessee in 2oo8 you can see a slide show of your photos from that same trip. LastHistory runs on a Mac. When you run it for the first time, you tell it your last.fm name. It then goes to Last.fm to collect your listening history and info about all of the tracks. (This can take a few minutes depending on how long you’ve been listening at Last.fm). But even while it is retrieving your data you can start to interact with the data. And interacting with this application is very fun. This app is cool in so many ways, I know that I’m going to spend a lot of time playing with this app. But ff you try it out, remember that it is a 1.0 version. I did experience a crash or two, but it seemed to pick up where it left off without trouble. Oh yes, one more thing that moves this app from totally cool into über-cool is that it is all open source. Get the code here: LastHistory on Github. Congrats to Frederik and Dominikus for creating the first novel music exploration app of the decade. Nice job! 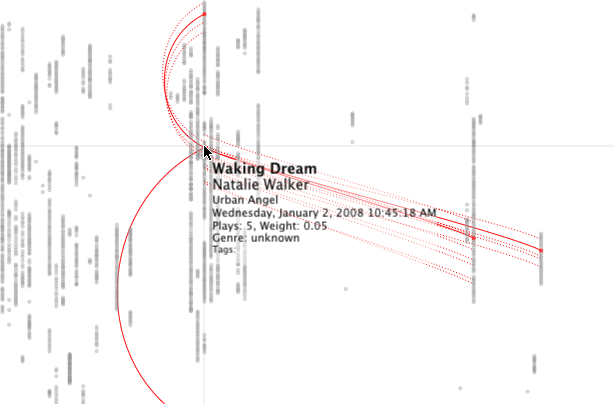 This entry was posted on February 16, 2010, 7:37 pm and is filed under fun, Music, visualization. You can follow any responses to this entry through RSS 2.0. Both comments and pings are currently closed. Thank you Paul for the fantastic review! I’m looking forward to see what users find out about their listening histories with this. Wow, LastHistory seems really amazing. Very good use case for personalisation or perhaps Semantic Desktop and it makes “only” use of Last.fm and Apple related products (iPhoto, iCal, iTunes). Of course, I can image with that configuration one will get a good audience, but that’s maybe just the beginning. What about a Windows port, including other sources e.g. acoustic metadata from content analysis (Last.fm tags are not everywhere widespreaded) or a better user experience e.g. a more intuitive search query modelling (e.g. event selection). I really like that development.